For the song by Scouting for Girls, see She's So Lovely (song). She's So Lovely is a 1997 American romantic drama film directed by Nick Cassavetes, written by John Cassavetes. At the time of its release, it received special attention because, eight years after his death, it was the first (and still only) posthumous film to feature previously unreleased material from John Cassavetes. 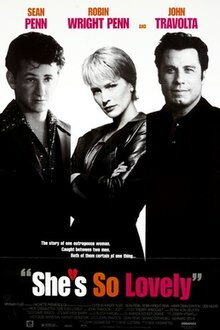 The film stars Sean Penn and John Travolta as the respective men who bid for the affection of Maureen Murphy Quinn (Robin Wright). Harry Dean Stanton co-stars as a friend of Penn's character, and James Gandolfini plays the abusive neighbor. Eddie Quinn's unruly wife Maureen drinks and smokes to excess, even though she is pregnant. Eddie has troubles of his own, disappearing for days at a time. When she is physically and sexually assaulted by Kiefer, a neighbor, it is more than Eddie can handle. He shoots someone and lands in a psychiatric hospital. Ten years go by. Eddie finally returns, only to find Maureen is now a clean, sober, solid citizen, married to a new man, Joey, and a mother of three children, one of whom is Eddie's own daughter. Eddie's return complicates and endangers all of their lives. She's So Lovely received mixed to positive reviews from critics, as it holds a 66% rating on Rotten Tomatoes based on 41 reviews. Writing in Time Out New York, Andrew Johnston remarked: "Watching the films of John Cassavetes now, one is struck by how complex and human his characters are, compared with those in even the most sophisticated of today's independent films. This effect is even more pronounced in She's So Lovely, an unproduced Cassavetes script given the '90s treatment and filled with stars by the late director's son. The final product features some of the year's best performances...."
Sean Penn won the award for Best Actor at the 1997 Cannes Film Festival. Robin Wright received a nomination for Outstanding Performance by a Female Actor in a Leading Role at the 4th Screen Actors Guild Awards. ^ Johnston, Andrew (September 1997). "She's So Lovely". Time Out New York: 77. ^ "Festival de Cannes: She's So Lovely". festival-cannes.com. Retrieved 2009-09-23. This page was last edited on 20 December 2018, at 11:50 (UTC).